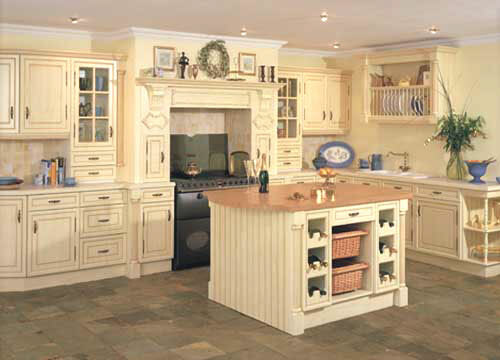 The popularity of this kitchen we believe, will be immense. Lemon pine vinyl with antiquing to the router lines, a frame within a frame. The outer line is emphasised by using false finials and the look is completed with a delicate filigree handle. All accessories are produced to match in colour, we show it here on an ivory carcase but maybe you would prefer to have oak carcassing. The choice is left to you to create a kitchen unique to your own home.